When deciding on a style, Faith was leaning toward French. “I would say sort of French country is probably the best way to describe this, although it’s very much a hybrid,” Chip says. Architect Chip Gardner and his wife, Faith, were on the market looking for homes to renovate and resell when they fell in love with one and decided to keep it for themselves. “It was just a very nondescript little white masonry house that I drove by hundreds of times and never really noticed,” Chip says. “The biggest draw was the lot. In Crestline, you are so on top of each other, and this gives us so much more privacy,” Faith says. The couple sold their other house in Crestline and were able to rent the house next door to their new purchase when they started construction about 18 months later. Renovations took a full year to complete, and the family finally moved into the house in July 2011. Although most of the lower level was part of the existing house, old portions are unrecognizable now, as the flow was reworked to convert the three bedrooms downstairs into one master bedroom suite with separate “his and her” bathrooms. A kid’s playroom plus a family den area, dining room, living room and kitchen complete the first floor. In total, the house jumped from 2400 square feet to roughly 4300 square feet after renovation and additions. “A lot of existing house was left,” Chip says. However, a second story was added to house the kid’s bedrooms, bathrooms and Chip’s study and to give the family more separation and privacy. “One of the decisions to leave so much of the old house was that it’s really well built, so we decided to work with it,” Chip says. “One of the decisions to leave so much of the old house was that it’s really well built, so we decided to work with it,” Chip says. They used terra cotta tiles from an old federal building for the roof, and all the stonework around the house was salvaged from the unusually large slabs that formed the patios of the old house to create a nice feature on the new property. 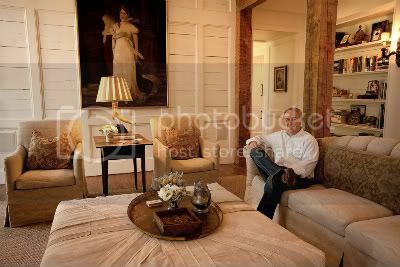 “So it’s definitely a taste of sort of taking what the house gave us to decide the design of the house,” he explains. Chip Gardner, a practicing architect for 25 years, started his own company, Gardner Architects LLC, 12 years ago. 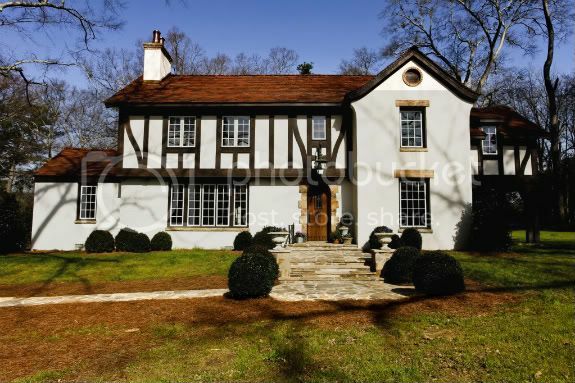 The company has done a mix of commercial and residential work, including many European (English and French style) homes in Mountain Brook. Designing and creating their own house was especially exciting and challenging for the couple. 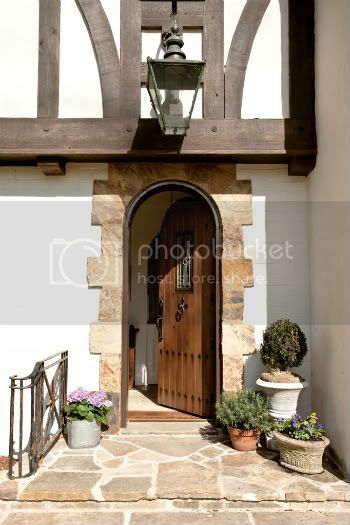 The attention to detail is what makes this house special, and although the style is mainly French, it also has a loose interpretation of English elements. 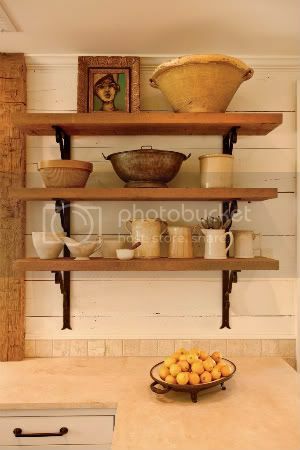 Throughout the kitchen and den are beautiful pieces of painted white wood that give the house a rustic feel, and in many cases, aging techniques were applied to give some of the materials an old feel and patina. All the beams and columns in the den are hand-hewn hemlock, and several rooms contain heart pine salvaged from old homes and barns. The fireplace in the den is a custom design that Chip himself cast by hand. In the kitchen, the floor is done in handmade French terra cotta tiles, and the backsplash is made of tumbled travertine that has small pieces of antique black terra cotta encaustic tiles from England inserted into the design. For interior design, Faith called on friend and designer, Beth McMillan, who has worked with Faith on their previous two houses. “Over the years I’ve just learned her style, which is beautiful, antique, timeless, classic. She does not get caught up in trends ever,” Beth says. The white interior and exterior allows the antiques to pop from the walls, while the room is pulled together through the use of solid fabrics that feel like the English countryside and incorporate texture through pillows, rugs and other fabrics. On the den wall is a large, striking portrait painting of a famous theater actress from Birmingham during the 1920s. The colors tie the room together, as well as showcasing a piece of history from Birmingham. Much of the furniture was acquired during Faith’s 10 years in the antique business. “What I have comes from a variety of places, from estate sales to Tara Shaw in New Orleans, flea markets, eBay and local dealers,” she says. And a lot of the furniture was recovered, much of it to look like it belonged in an old French gîte. “I was after a refined rustic look,” she says. “I wanted it serene and peaceful and calm"
Interior design – Beth McMillan; McMillan Interiors, Inc.
Wood source – Antique Building Materials, Inc.
Posted on Sunday, April 1st, 2012.